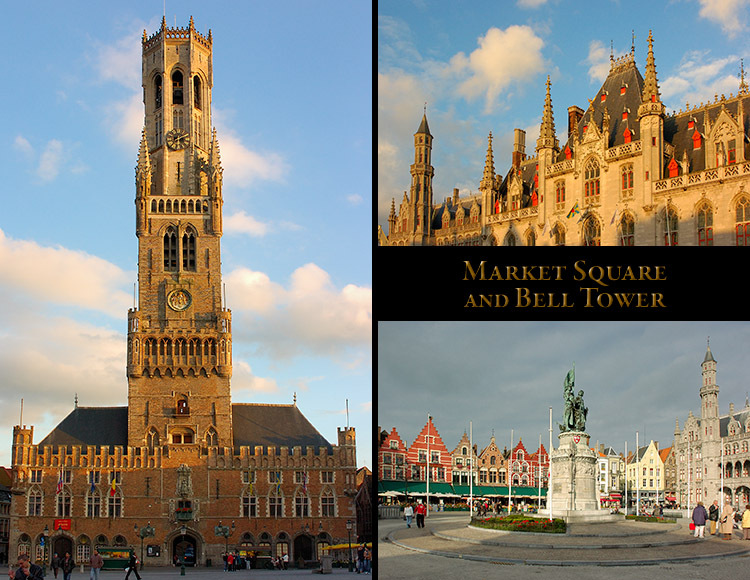 Ministry of Public Works, the 13th c. Bell Tower and Cloth Market, and is surrounded by restaurants and shops. Restaurants and Shops of Market Square (Grote Markt) and the Neogothic Ministry of Public Works (right). The statue in the center of the square commemorates Jan Breydel and Pieter de Coninck, the leaders of the Bruges Matin and heroes of the Battle of Golden Spurs in 1302. The French King wanted to take over Flanders, which was formally a part of the French Kingdom, but which resisted French rule. Philip IV appointed a French Governor of Flanders and took hostage the Count of Flanders, instigating unrest. 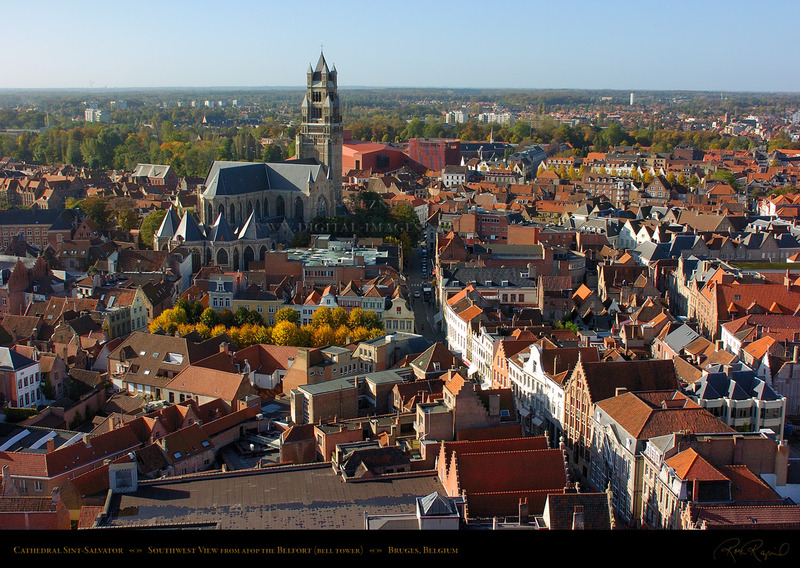 Rebel citizens of Brugge (Flemish for Bruges) who were part of the local militia led by Jan Breydel and Pieter de Coninck, relocated outside the town before the French troops arrived. Their families and other remaining citizens were harassed by French troops. The rebel militia returned to the city one morning and murdered every person who could not properly pronounce a Flemish phrase. 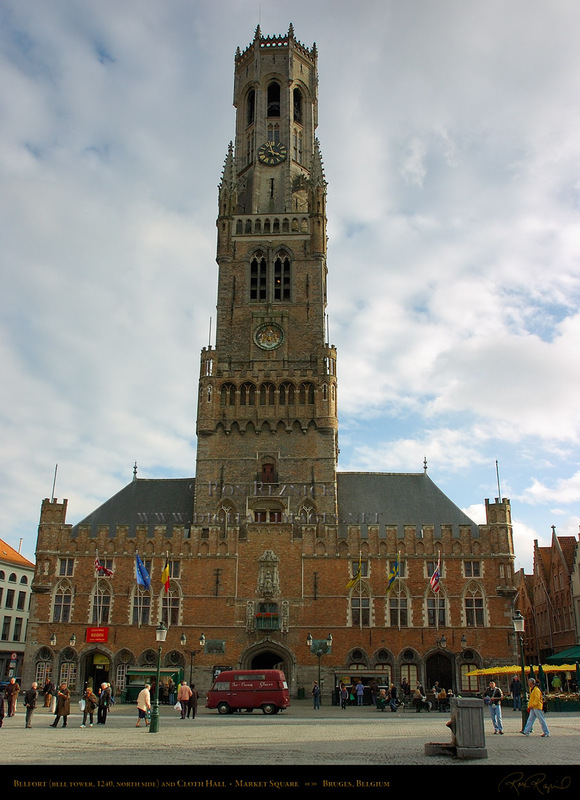 This incident known as the Bruges Matin led to the Battle of the Golden Spurs (Battle of Courtrai). 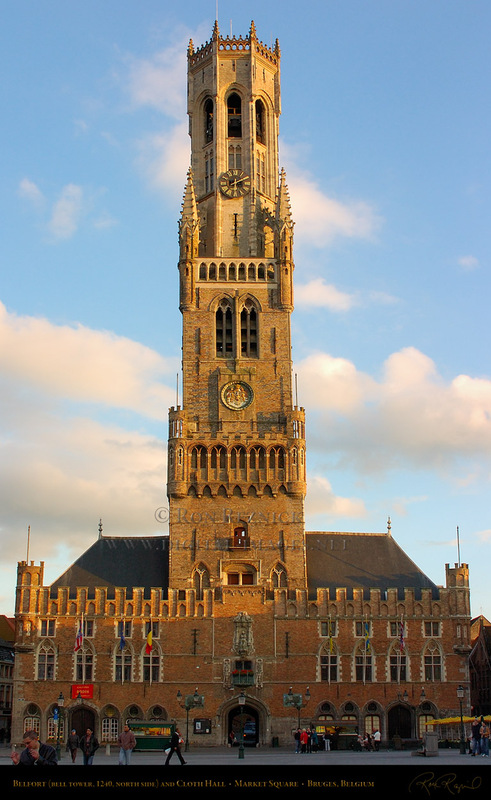 Philip IV sent a strong force under Robert of Artois, which was defeated by two groups of Flemish militia in a field outside the city of Courtrai (south of Bruges), primarily due to poor strategy of the French and a sound position by the Flemish. No prisoners were taken, and the name of the battle is derived from the large number of golden spurs taken from the bodies of at least 1000 French knights. The battle killed over 40% of the French nobility and the heads of over 75 French noble families, forcing all military leaders to rethink the use of cavalry in future battles. It was one of the worst defeats in French military history. 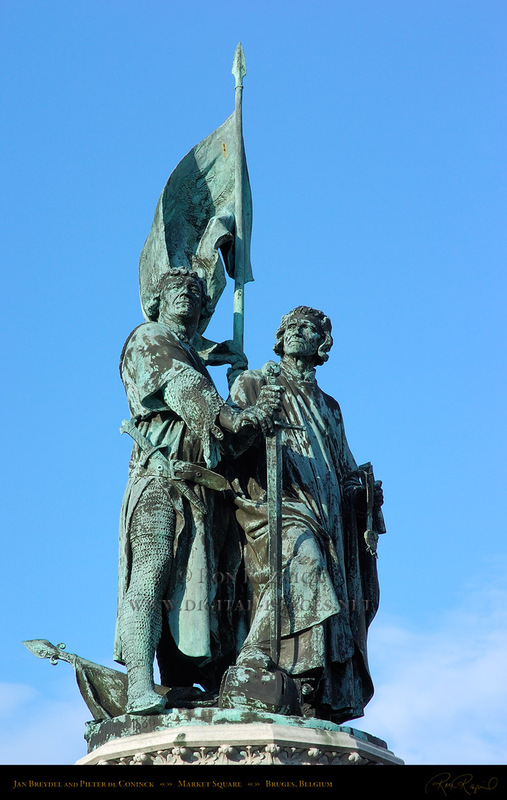 The successful tactics led to the Infantry Revolution, and additional defeats of the French by the English at the Battle of Crécy in 1346 and the Battle of Agincourt in 1415 (both important defeats of the French during the 100 Years War). These and other defeats of cavalry along with large numbers of archers armed with the English longbow in the 13th and early 14th centuries led to the gradual reduction of expensive mounted knights and greater reliance on heavily armed infantry. 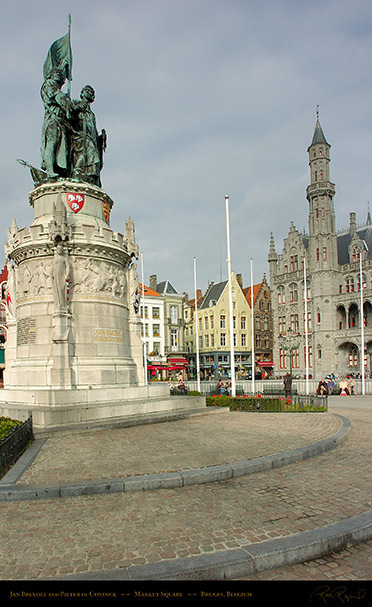 Detail of the statue of Jan Breydel and Pieter de Coninck, with the Neo-Gothic Ministry of Public Works (background right). 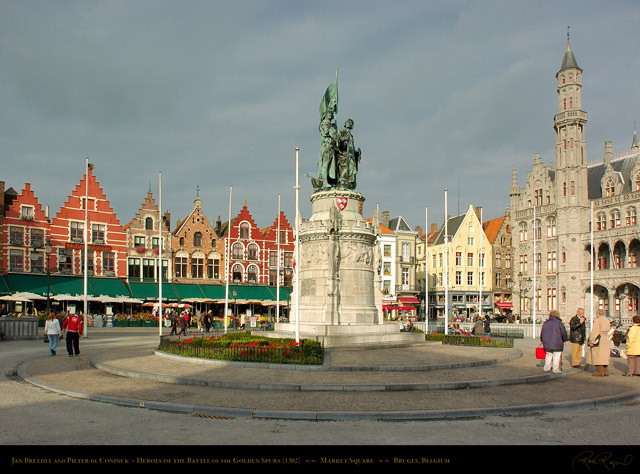 The statue of Jan Breydel and Pieter de Coninck, Heroes of the Battle of the Golden Spurs, was installed in Market Square (Grote Markt: Great Market) in 1887.
which was built in 1910-1914 from an Eclectic Neo-Gothic design by architect J. Coomans of Ypres. the tower of Poortersloge (Burgher’s Lodge, shown further below in the aerial shots section). Diners at the Taverne Brugeoise brasserie and tea room on Market Square at Geernaartstraat, with the Neo-Gothic Tower of the Ministry of Public Works in the background at right. 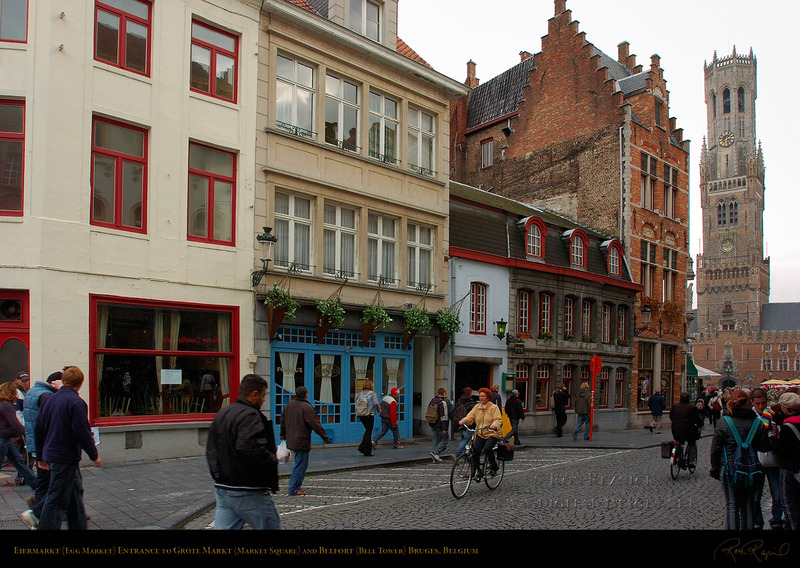 The image at right is a view down the narrow medieval street Geernaartstraat, which links Grote Markt with Eiermarkt (the Egg Market). 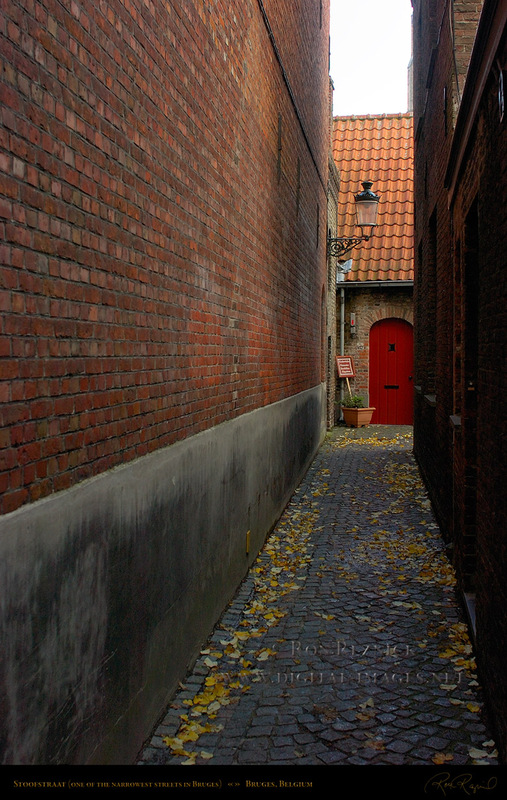 Most streets in Bruges (Brugge in Flemish) are quite narrow... some are so narrow that you can touch walls on both sides of the street, e.g. Stoofstraat (Stove Street) on the Canals and Street Scenes page (example linked below). 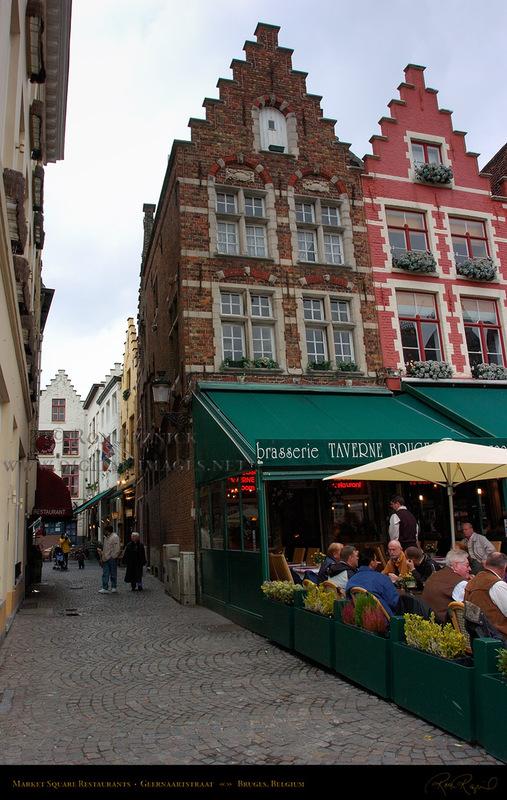 Stoofstraat, one of the narrowest streets in Bruges. 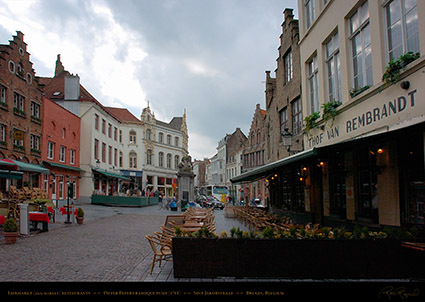 The view down Geernaartstraat from the far end of the Eiermarkt (Egg Market). 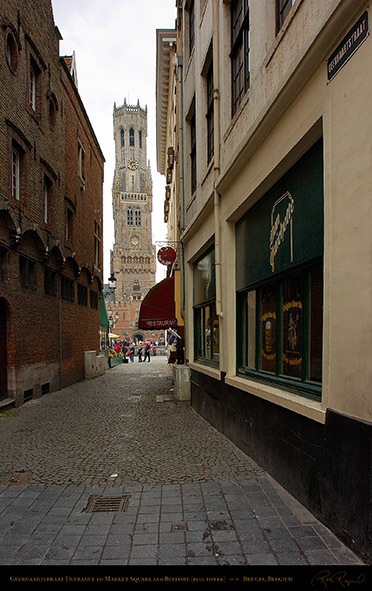 The Geernaartstraat entrance to Grote Markt is directly opposite the 13th c. Belfort (bell tower). 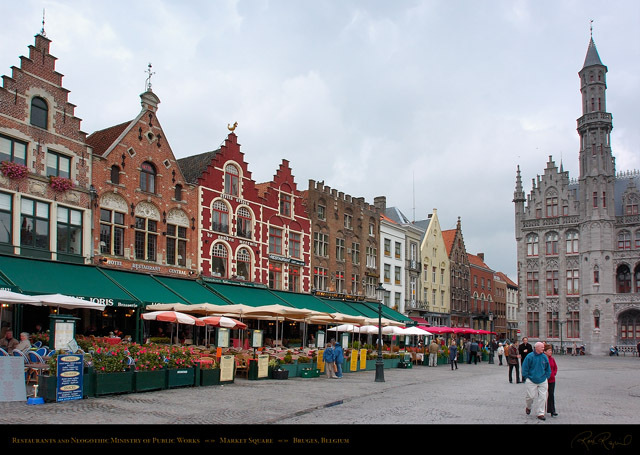 The Eiermarkt (Egg Market) entrance to Grote Markt (Market Square), with the 13th c. Belfort (bell tower, 1240) at the right. 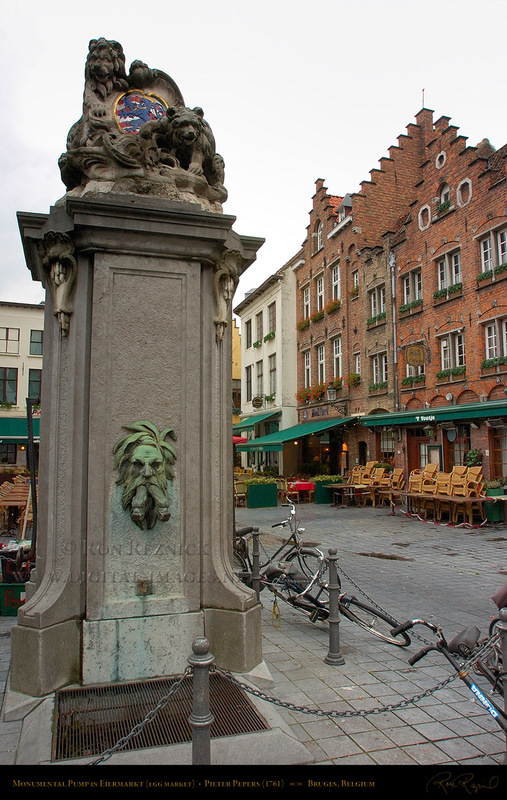 The Eiermarkt (Egg Market) behind Market Square, with the monumental pump by Pieter Pepers in the background. Medieval towers, stepped gables and horse-drawn carriages on the Grote Markt. Stepped gables are common in Bruges. Market Square sans tourists, preparing for a new day. 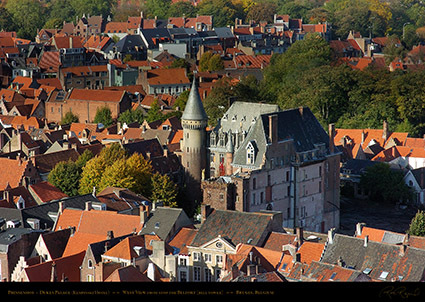 The crenellated building at left (with tower) is Craenenburg House. 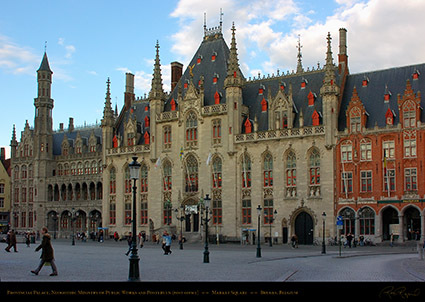 The current Craenenburg house was built on the site of the medieval house where the Counts of Flanders used to watch tournaments from the windows, and where Maximilian I (later Holy Roman Emperor) was arrested for 22 days in 1488.
offices of the Governor of the Province of West Flanders, and at right is the Posteruen (Post Office). the 1878 fire. 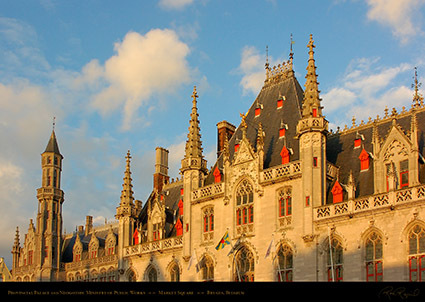 The principal construction was completed by 1909 under the direction of Louis Delacenserie. 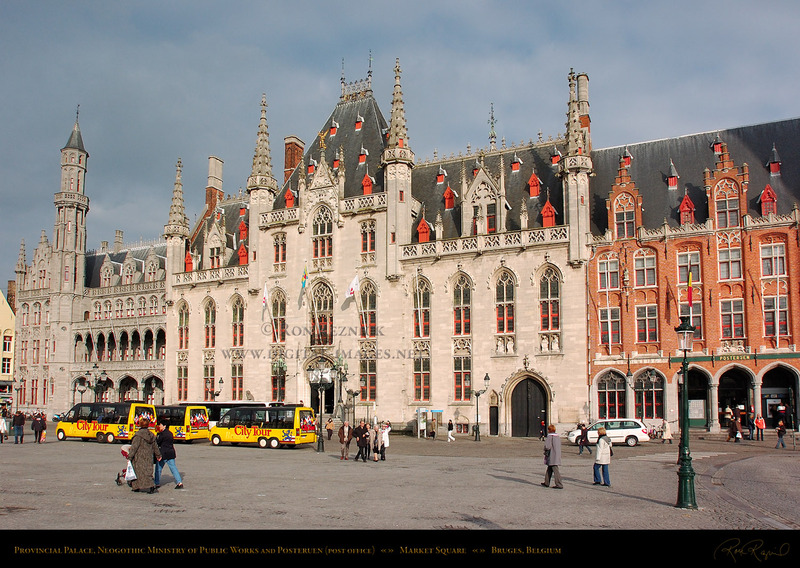 The Provincial Palace, formerly the Water Hall (1294-1787), which was used for offloading cargo carried on the canals. The Provincial Palace was rebuilt in Gothic Revival style by Louis Delacenserie, the Architect of Bruges (1881-1921). Provinciaal Hof (Provincial Palace on Grote Markt) at sunset. 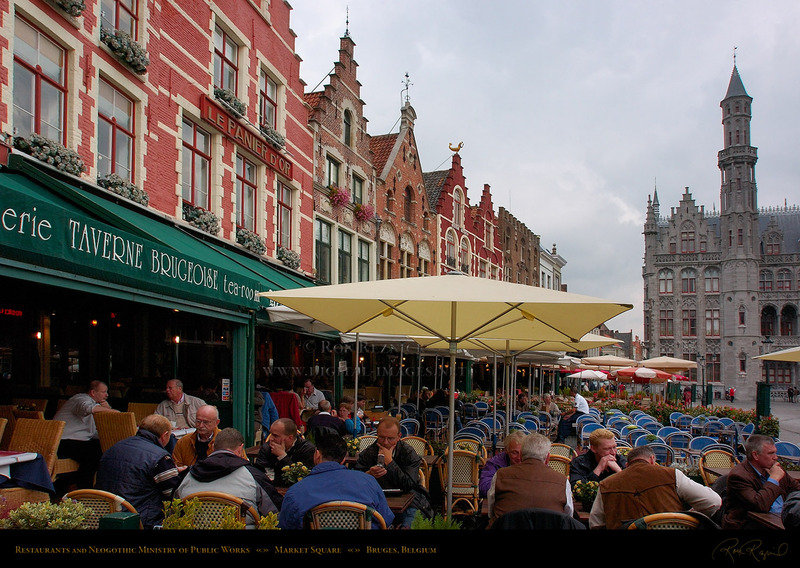 Light in Bruges can change radically from moment to moment. 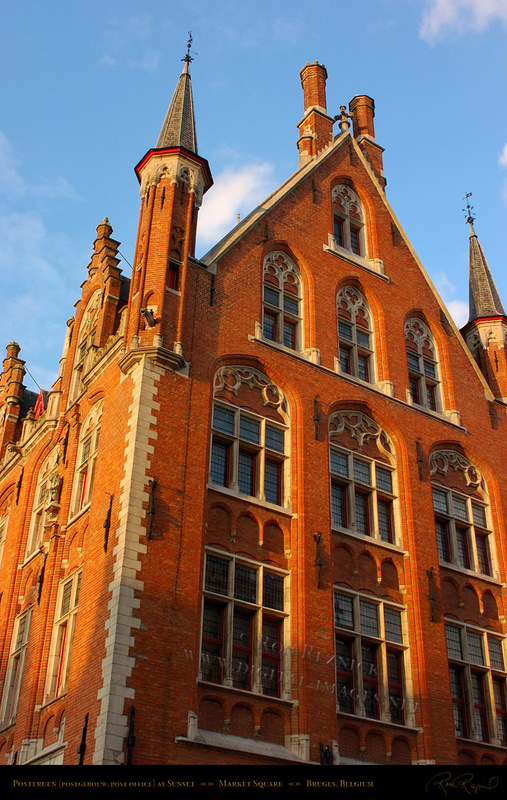 corner of Wollestraat and Briedelstraat in the golden rays of sunset. Built between 1885 and 1891 by Louis Delacenserie in Neo-Bruges style. 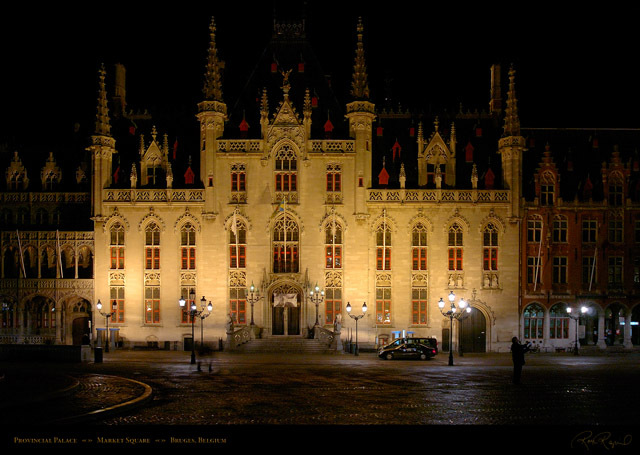 A tremendously difficult 2/3 second hand-held shot of the Provincial Palace at night. be a dangerous obstruction on the narrow streets of Europe, I did not bring one with me. at 22mm, 2/3 second at f/8 with the 17-35mm f/2.8 (for those who may be interested). 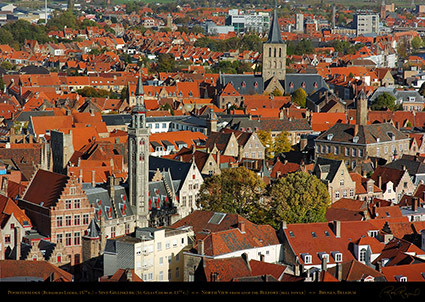 prosperity (Bruges was important in the Flemish textile industry from the 13th century). The octagonal upper section was built 1482-86, and the parapet was added in 1822. 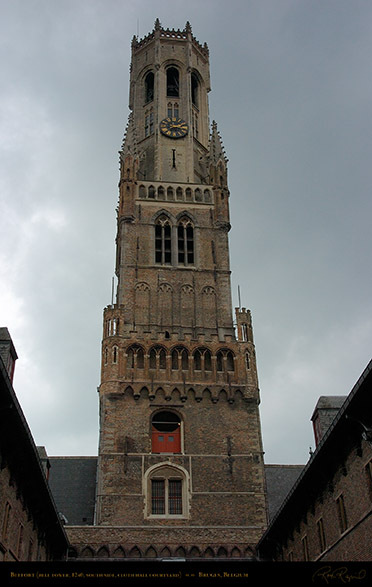 The 1240 construction of the current bell tower replaced a wooden tower from 1211.
severe storm (1389), restored by master mason Jan van Oudernaede (1395). 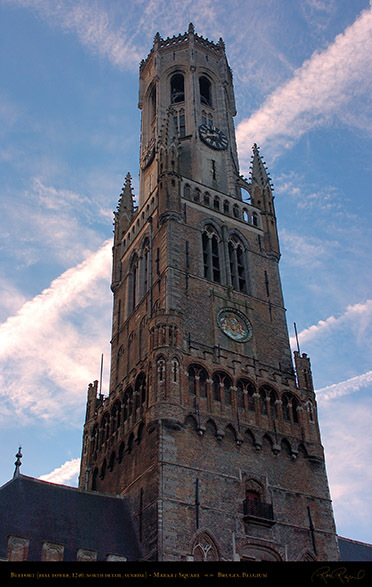 were destroyed when the tower was struck by lightning. 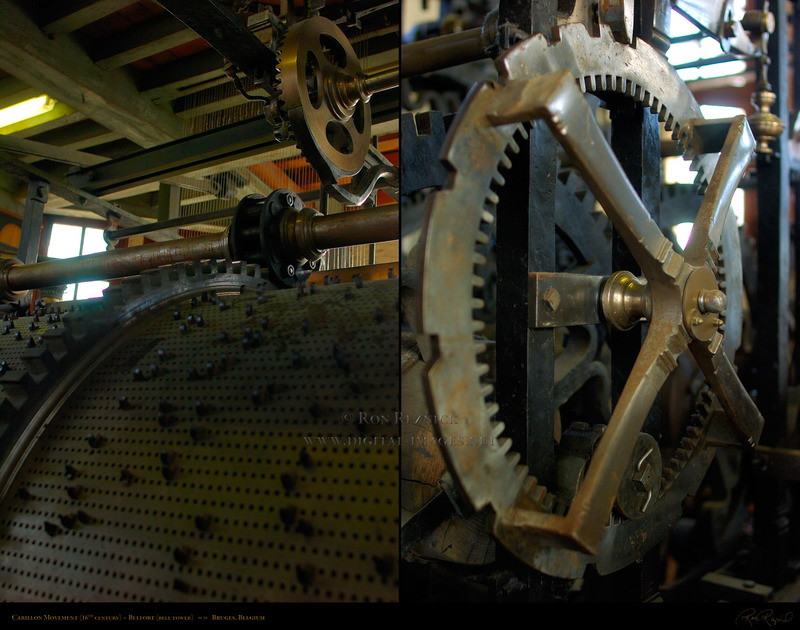 carillon and the clock mechanism were replaced. The Belfort was rebuilt three times after the fires in 1280, 1493 and 1741. Thrice consumed and thrice rebuilded, still it watches o'er the town. The south entrance to the Cloth Hall Courtyard on Oude Burg. 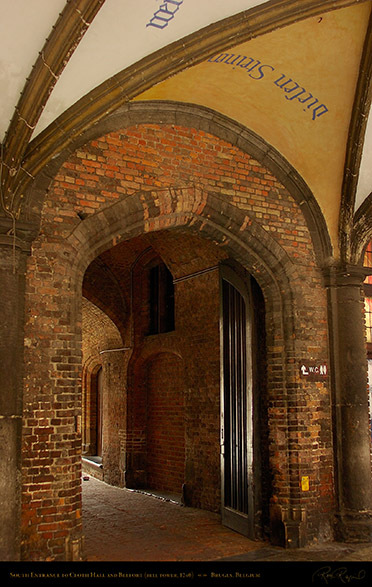 The Gothic arch and rib-vault is inside of a 13th c. colonnade. looming over the Cloth Hall Courtyard. (Bell Tower) taken from Market Square (Grote Markt). 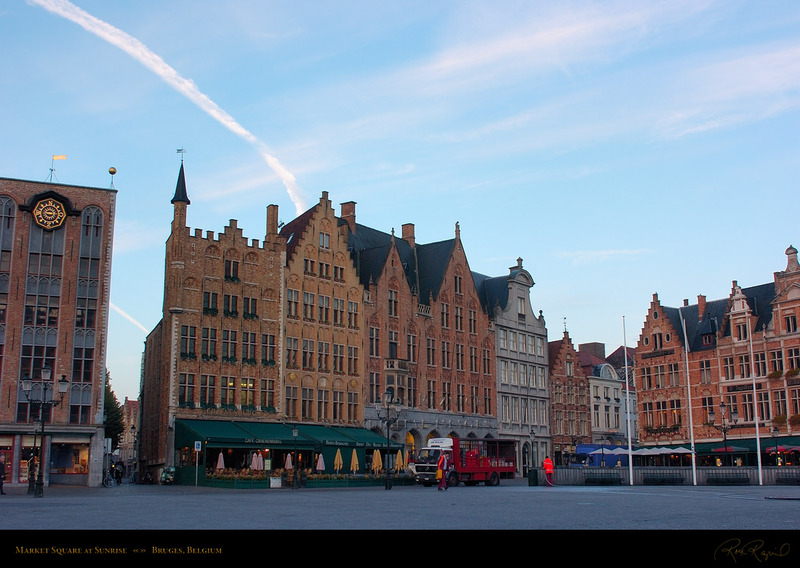 The Belfort is the most well-known landmark of Bruges. 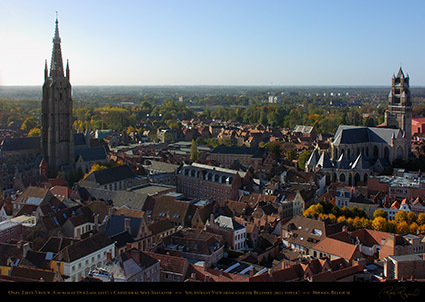 The Cloth Hall and Belfort in the golden rays of sunset. watchtower and carillon. 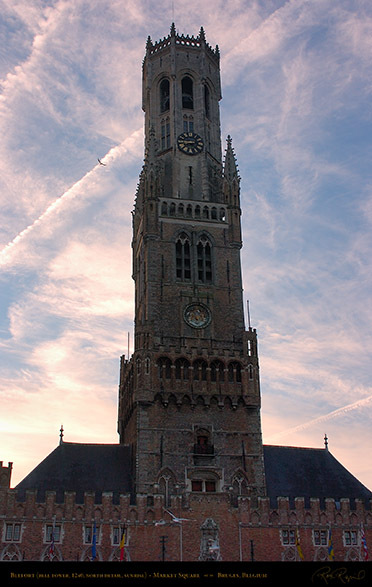 The tower leans about a meter to the east (left). 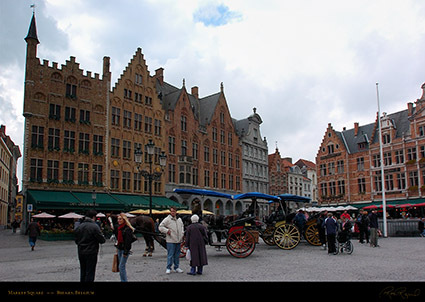 medieval trade center until the silting up of the Zwin in the 15th century. A large detail crop of the North side of the Belfort. and have larger text in the title bars than other images in this section. A dramatic low-angle oblique taken at sunrise. 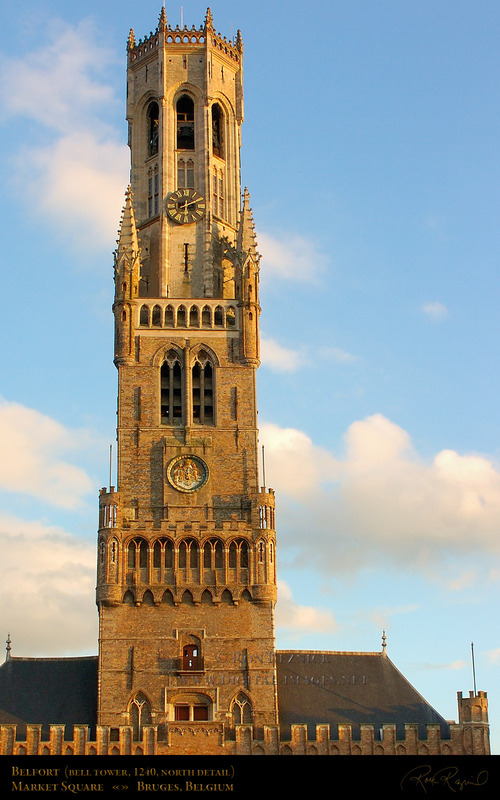 The Belfort stands 83 meters (273 feet) tall. 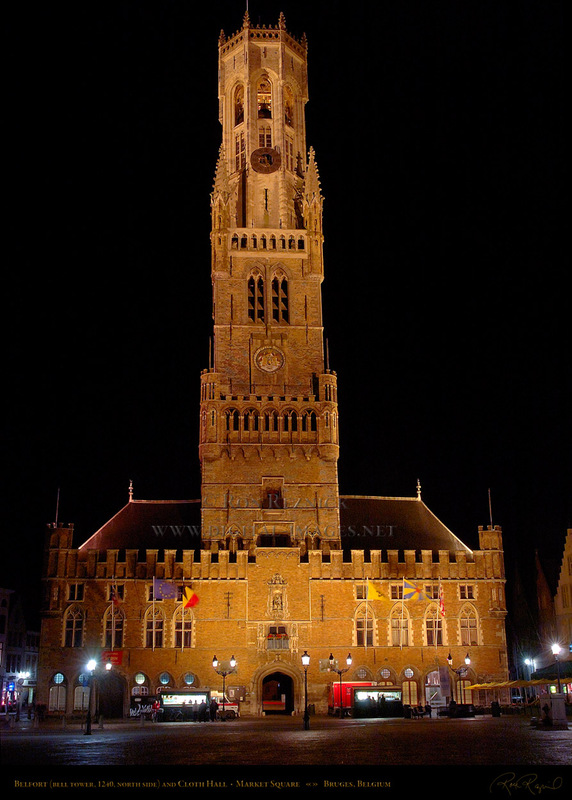 A ridiculously difficult 1.3 second hand-held shot of the Belfort at night. long exposure hand-held shot requires a steady hand and lots of practice. I climbed the 366 steps to the top of the Bell Tower to get some aerial shots of Bruges. (they also employ a full-time Bell Ringer who occasionally gives impromptu concerts). 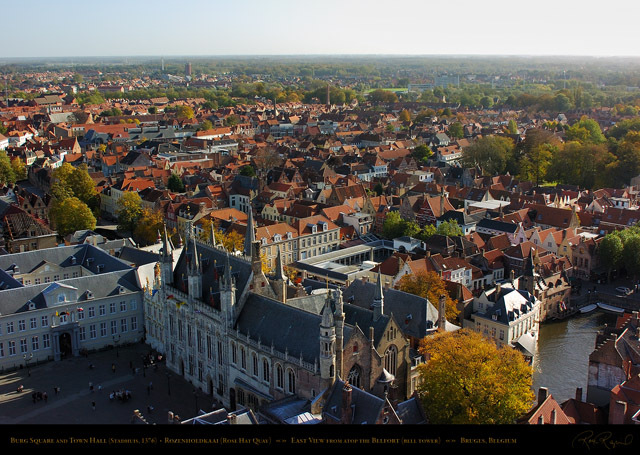 The peals from the 47 bells are unbelievably loud from inside the bell tower. 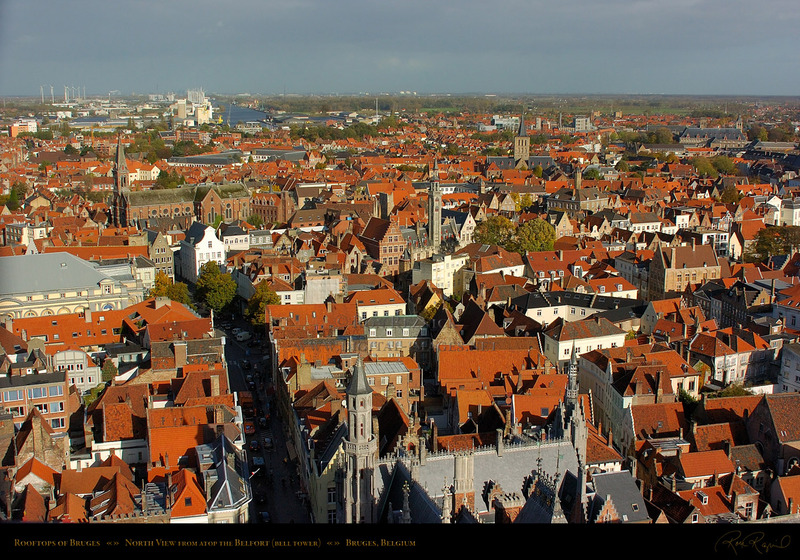 North view from atop the Belfort with the docks in the distance. 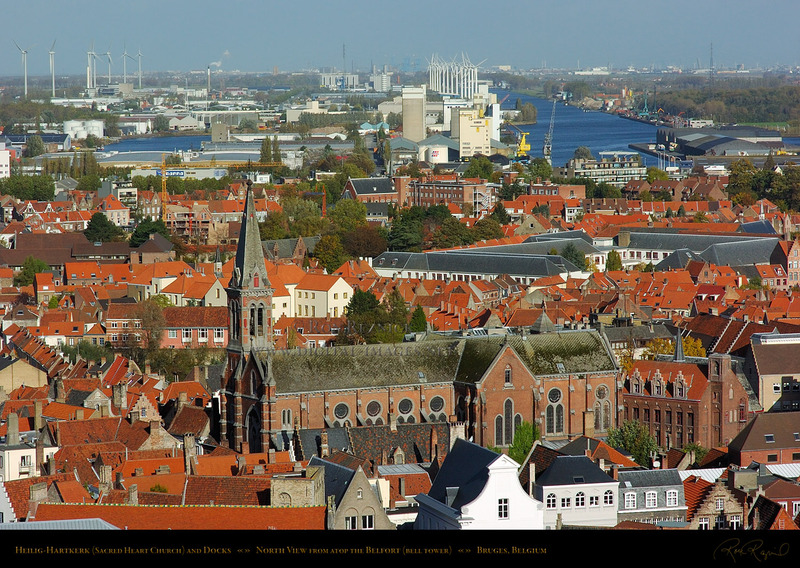 The church at center left is Heilig-Hartkerk. 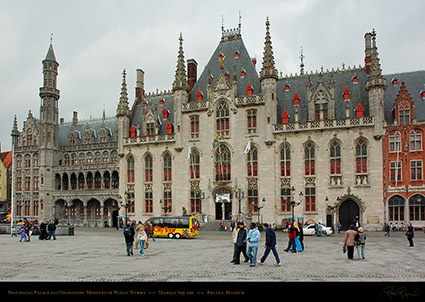 The Gothic tower of the Ministry of Public Works is at the bottom center. 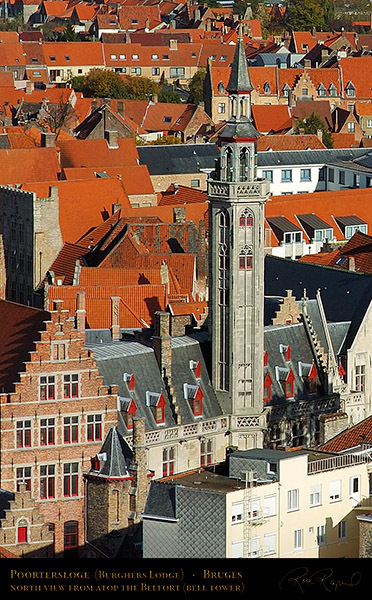 The slender tower in the center is Poortersloge (Burgher’s Lodge). A telephoto closeup of the area shown in the right center of the previous image, with detail of the Poortersloge (15th c. Burgher’s Lodge, left) and Sint-Gilliskerk (St. Giles Church, 13th century, seen at the upper right). A detail crop of the early 15th century Poortersloge (Burgher’s Lodge). (Sacred Heart Church, the former Jesuit Church in Bruges) and the Lodewijk Coiseaukaai docks. 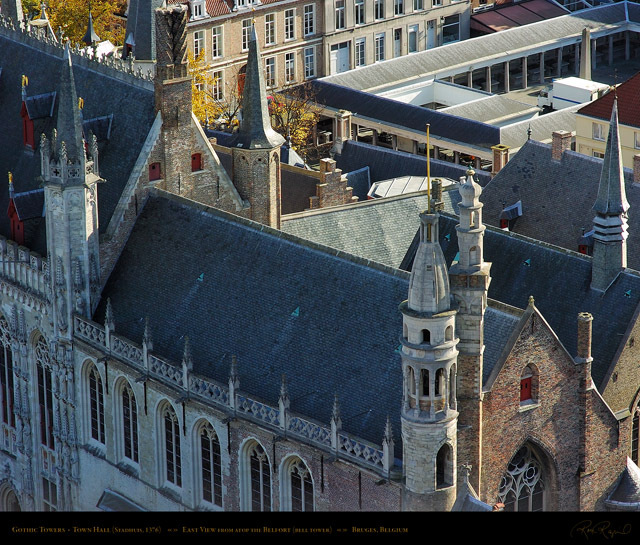 at left, and Cathedral Sint-Salvator on the right. 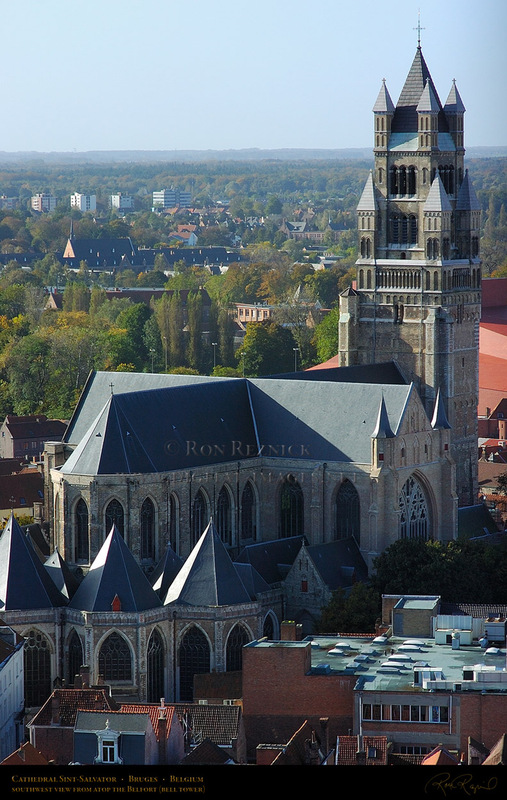 Cathedral Sint-Salvator was originally built in the 9th century as a parish church (the Cathedral was Sint-Donatius, which was destroyed by the French during the French Revolution). The oldest surviving part of the cathedral is the base of the tower (12th C.), much of the rest was built over the later centuries. The upper part of the tower was built after the fire of 1839, when the English architect R. Chantrell restored the cathedral under the direction of Bruges architect P. Buyck. Cathedral Sint-Salvator contains many works of art from the Sint-Donatius cathedral (destroyed by the French), including tapestries manufactured locally, the original paintings which the tapestries were made from (an unusual combination), and the weapons of the Knights of the Golden Fleece. The Order of the Golden Fleece is an Order of Chivalry similar to the English Order of the Garter. It was founded in 1430 by Philip III, Duke of Burgundy when he was elected to the Order of the Garter but had to decline to avoid offending the King of France. 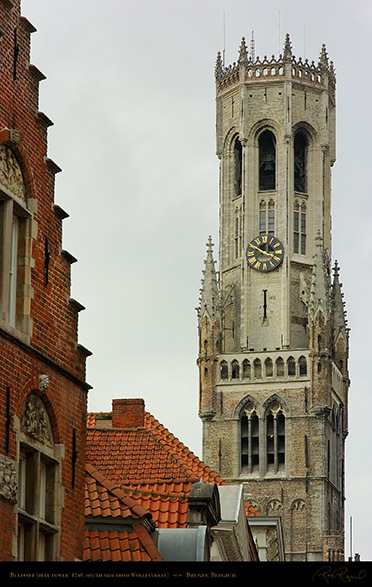 The weapons on display in Sint-Salvator are those of the original 24 Knights elected at the meeting that founded the Order of the Golden Fleece. 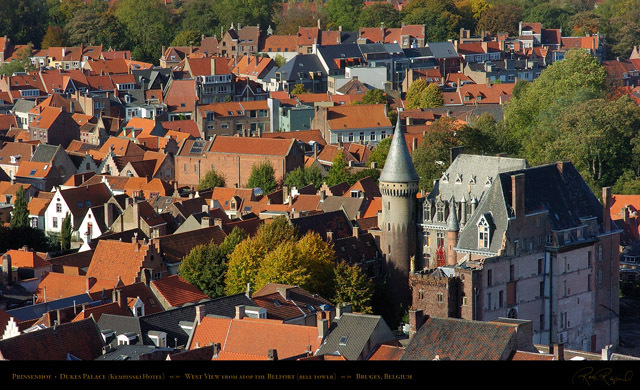 The West view from atop the Belfort showing the Prinsenhof, the former Palace of the Counts of Flanders and the Dukes of Burgundy. This shot was taken when it was being restored and converted to the Kempinski Duke’s Palace Hotel. It was originally built in the 14th century, which is the period of construction of the circular tower with the conical peak. West view from atop the Belfort (Bell Tower), with the Prinsenhof (Duke’s Palace) at right. 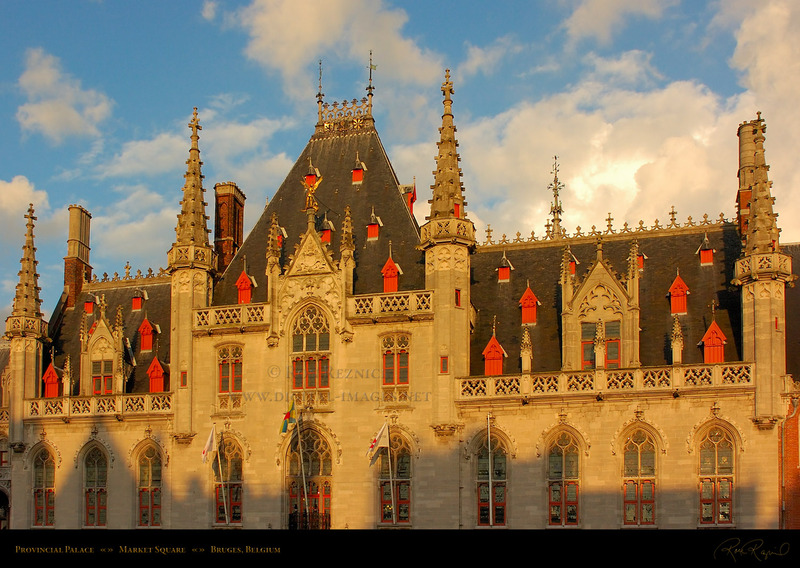 de la Retraite du Sacre-Coeur uit Boulogne and renovated in the French Gothic Revival style. at the lower left and center, and Rozenhoedkaai (Rose Hat Quay) at the lower right. 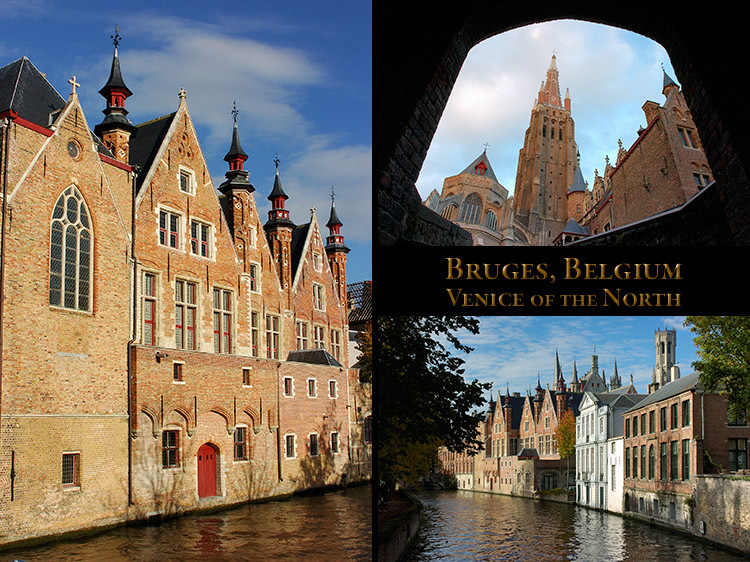 detail on both the Canals and Street Scenes and Houses and Buildings pages. A telephoto detail shot of the Gothic Towers of the Stadhuis (Town Hall, 1376). 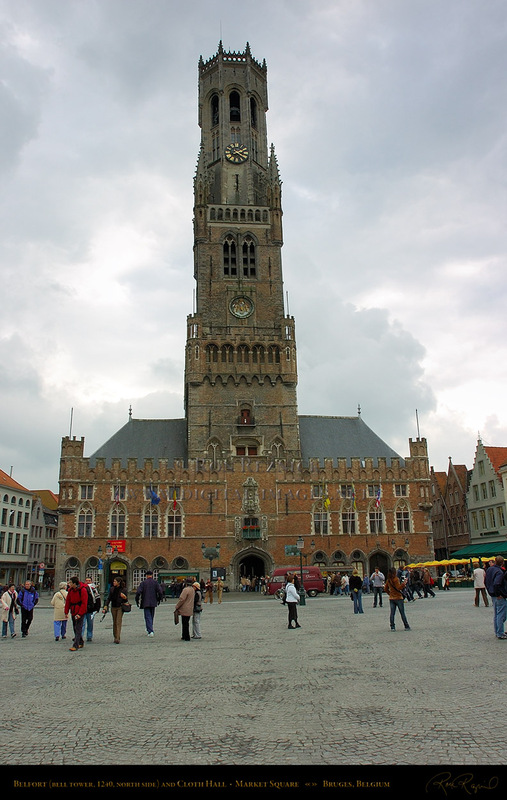 Three of the towers on the Burg Square side of the Stadhuis end in octagonal turrets.